Today’s school-run shoes are these khaki Nike trainers (UK speak for sneakers). 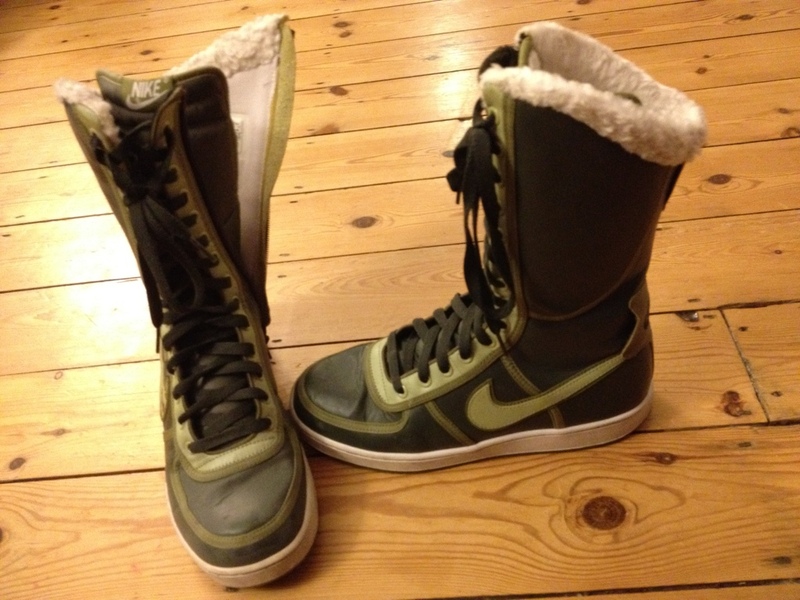 Trimmed in various shades of green, they’re higher than high-tops (does this make them top- tops?!) and lined with lovely warm faux sheepskin. These Nikes might be lace-up, but they come with a super-handy zip at the side, which is infinitely preferable to endless threading and lacing first thing in the morning and last thing at night! The trainers came with additional matching removable military-type straps (you can see the loop-hole for these at the heel), which I took off one day and now can’t find: Grrr… Just as well they’re still perfectly functional without them!